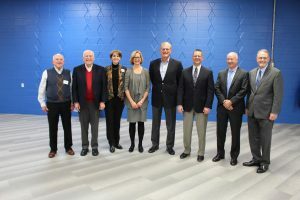 The Marian High School Athletic Hall of Fame Class of 2019 was honored on Friday, January 18 at a dinner in Marian’s recently renovated cafeteria. 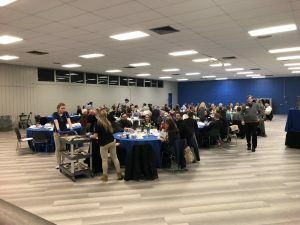 There were over 120 people in attendance from as far as away as Florida. The twelve honorees commemorative plaques are on display in the lobby of the Bishop Crowley Activity Center. 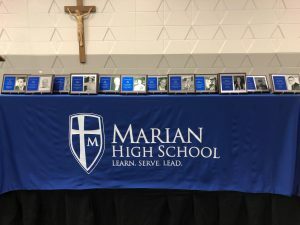 The inductees or their representative shared memories and great stories so that all in attendance gained a new understanding of what it truly means to be a Marian Knight! 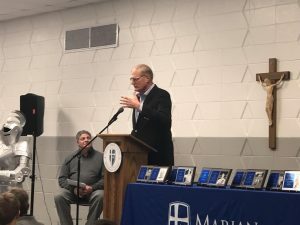 Marian Alum Tony Catanzarite ‘74 was the emcee for the evening. 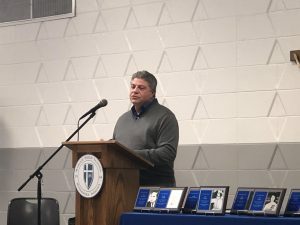 Tony did a tremendous job from the perspective of a parent as he shared many personal stories about the inductees and he reminisced about the important games and victories throughout the years. 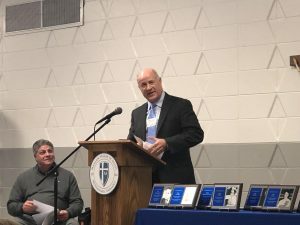 Tom Burzynski’s son, John, began the evening with a heartfelt talk about his father’s time as a teacher, coach, and assistant principal (1964-1972). 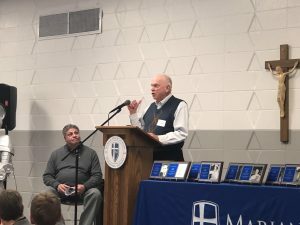 He shared his dad’s true affection for Marian and fellow Hall of Famer Coach Bob Otolski. 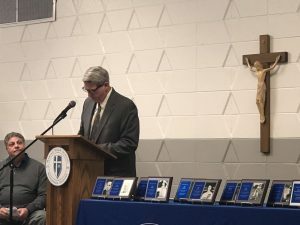 Later, Tim Nicolini read a heartfelt letter from his brother Mark ‘70 about what it was like to be a four-sport athlete in the late 1960’s and play for Coach Otolski. 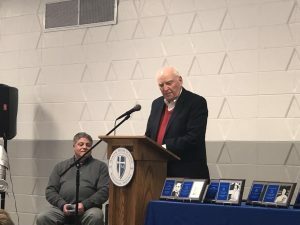 Coach Don DuBois read a letter from the Butler University basketball coach about Marty Monserez and spent time talking about his players and his memories during the magical 1969 season that saw the basketball team claim the first Sectional Championship in school history. 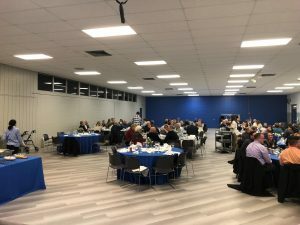 Members of that team were inductees Kevin Canfield ‘70 and Marty Monserez ‘70 who mentioned each other in their speeches with shared memories and great admiration. 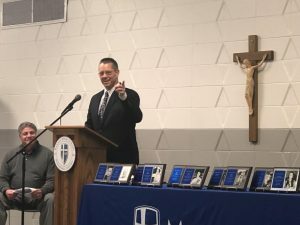 Kevin talked about how intense Marty was as a basketball player and Marty reminded Kevin that he had set eight school records during his time playing football at Marian. 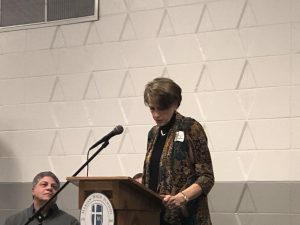 Jeanine (Bauters) DeGeeter ‘76 talked about her time with the volleyball team and what it was like playing on a State Championship team. 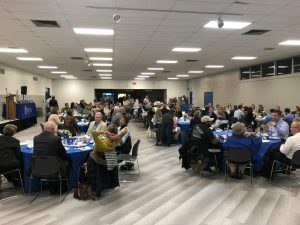 However, she said the Marian cafeteria brought back her fondest memory— it was the room she where her wedding reception was held 38 years ago. 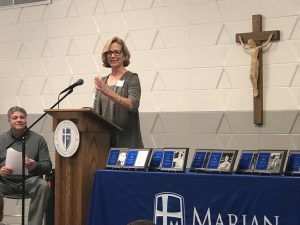 Mary Jo (Creevey) Peterson ‘73 spoke eloquently about being a member of Marian’s first State Championship volleyball team in 1973 and her admiration for her brother Tom ‘70 who is already a member of the Class of 2009 Athletic Hall of Fame. 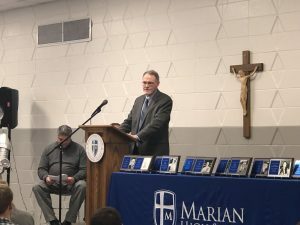 Bill Killilea, who is the proud parent of seven children who are all Marian High School graduates, spoke of his love of Marian despite not being a graduate himself. Bill chaired a committee to build the football stadium and worked on the capital campaign that added Science classrooms and the Bishop Crowley Activity Center. He was also the longtime announcer at home football games. In his speech, Bill proclaimed that he was officially a Knight. The people who know him understood a long time ago he was already a genuine Marian Knight! 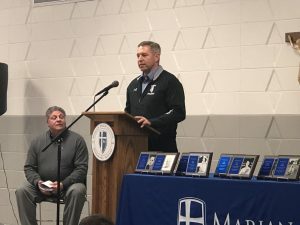 In the baseball segment of the program, coaches Joe Nucciarone and Tim Prister’ 78 spoke fondly of their time at Marian. Tim had the unique experience of being an athlete and a coach for the Knights. Both men spoke of the 2008 and 2011 teams that played for the state title. 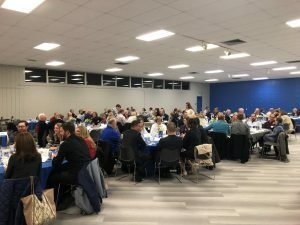 Both talked about building a culture of success and what it took to break through and experience an immense amount of success from 2004-2012 when the teams earned a record of 172-98 with three Sectional, two Regional, and two Semi-State championships. Steve Ravotto, Athletic Director spoke on behalf of Deb Lynch ‘85 who was unable to attend due to her duties as a Principal in Arizona. 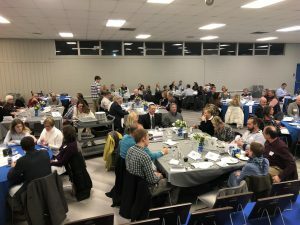 Steve shared what a phenomenal athlete Deb was during their time at Marian when she was named Marian’s Female Athlete of the Year by the Kiwanis Club and the South Bend Tribune’s Female Athlete of the Year. Deb earned a full ride to Arizona State University and was on the team when they won the National Championship in volleyball. She was also a Scholar Athlete and competed internationally. 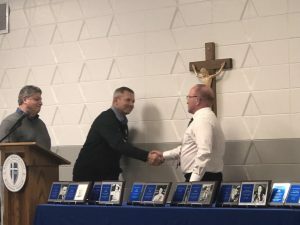 The evening concluded with Coach Reggie Glon accepting the award on behalf of Father Donald Verhagen who served as the first principal of Marian High School. He spoke of the mutual love and affection between Fr. 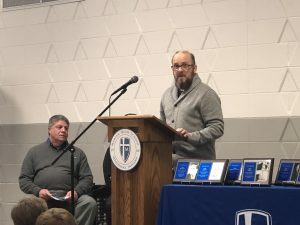 Verhagen and the Marian community. 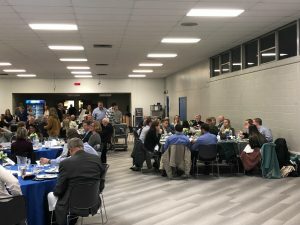 Overall, Friday night was excellent reminder of the motto that circulates through the Marian Community – Once A Knight, Always A Knight.